The Federal Trade Commission has announced the launch of a new website, IdentityTheft.gov, a resource that makes it easier for victims to report and recover from identity theft. The new website provides an interactive checklist that walks people through the recovery process and helps them understand which recovery steps should be taken upon learning their identity has been stolen. It also provides sample letters, specialized tips for specific forms of identity theft, and advice for people who have been notified that their personal information was exposed in a data breach. A Spanish version of the site is also available. 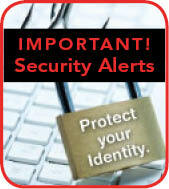 Return to CIBM Bank's Fraud Prevention Information page. CIBM Bank is committed to protecting your personal and account information. We have account monitoring systems and other controls in place to recognize and help prevent fraud. CIBM Bank will never attempt to gain your personal or account information via email, text message or automated phone calls. Attempts such as these should be considered fraud. If you are contacted in this manner or believe you are the victim of bank fraud, contact your local branch immediately for assistance. Click for locations.